Not a bad vision, right? And so we find ourselves here today. I am super excited to have these cute little pumpkin donuts participate in a virtual pumpkin party. What’s that you say? What’s a virtual pumpkin party?? 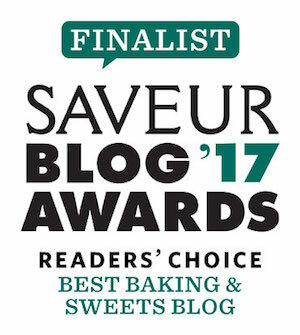 Over one hundred food bloggers have come together to create just as many recipes all based around pumpkin. 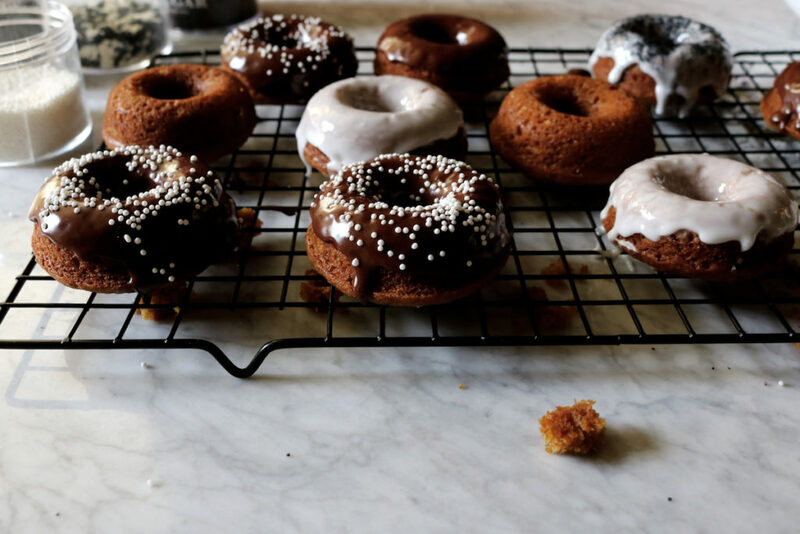 There are cakes, pudding, soup, stuffing, smoothies, fudge, pasta, dumplings, risotto and yep, these brown butter pumpkin donuts. 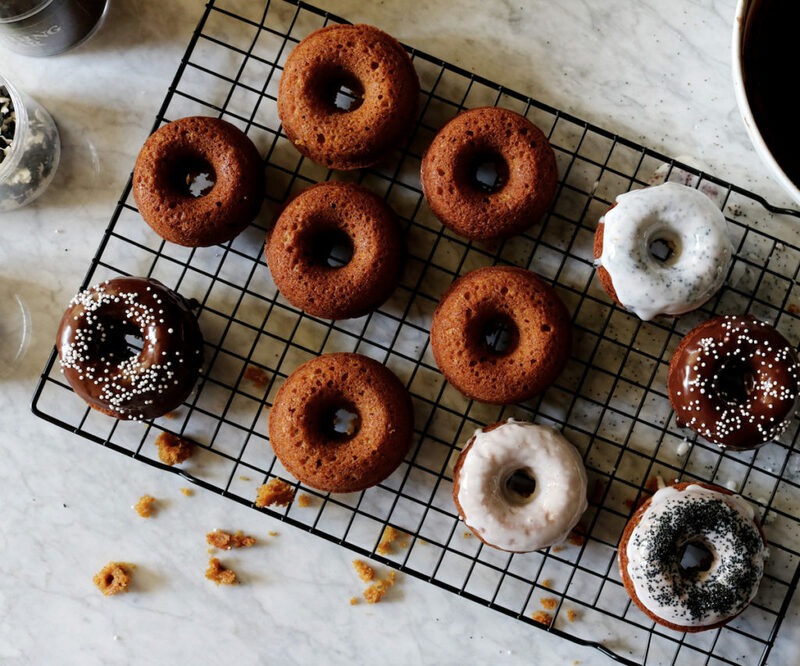 I have links to everyone’s recipes below….scroll just below my pumpkin donuts recipe! A special THANK YOU to Sara at Cake Over Steak + Aimee at Twigg Studios for planning + organizing!! Donut Tin. Invest in one. 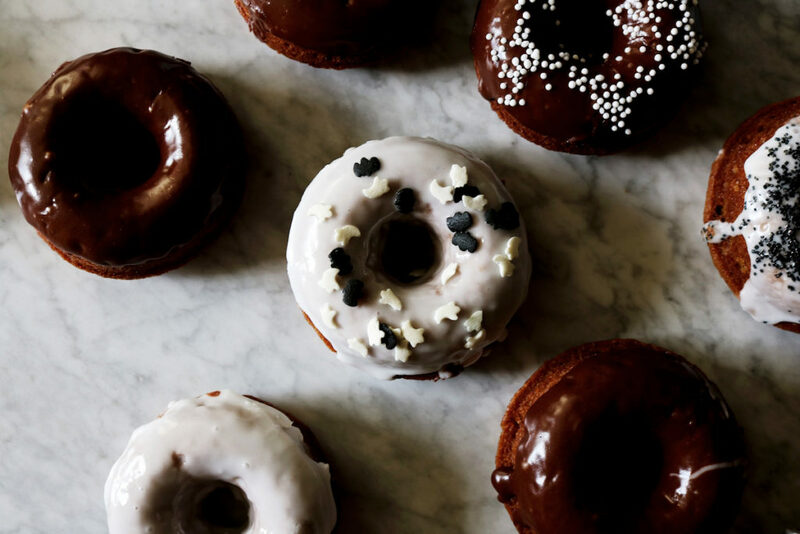 There are plenty of donut recipes out there and you don’t have to get dressed to eat donuts. I don’t think you need any more incentive than that. Butter. We need a fair amount of butter for the entire recipe. You need butter for the donuts, for your donut tin and to brush on the donuts just prior to baking. I think it’s completely necessary to butter the tin and brush the pre-baked donuts prior to baking because it lends a crispiness to them that baking without doesn’t give. That said, if you just can’t be bothered, you be you. Filling Your Tin. You’re going to want to fill the tins with more batter than you should. Resist this urge. You should fill them anywhere between 1/2 to 3/4 full…erring on the smaller side. I highly recommend piping the donut batter into the tin. If you don’t have pastry bags (which is fine), use a plastic bag. Place the bag in a large vase, with the edges hanging over the side. Put the batter inside the bag, twist the top to push everything to the bottom and cut a small corner of the bag…this is where you’re going to squeeze the batter out. Got it? Good. Let’s get our bake on. **To sprinkle on top: hella sprinkles, chopped nuts + pepitas and/or chopped chocolate. ***You will need to add additional milk to thin the glazes as they will firm up as they sit. Preheat oven to 350 degrees F. Use 1 tablespoon of butter to butter your donut pan. Set aside. Put 1 stick of butter in a small sauce pan and melt over medium heat. Once melted, crank up the heat to medium high. Stand by, stirring and watching. This isn’t the time to go and put your dry ingredients together. Watch yer butter. Small golden bits will start to settle on the bottom of the pan. Once this happens, take it off the heat and pour into a medium, heat-safe bowl. Let cool a minute or two before moving to the next step. Add the pumpkin puree, granulated sugar, brown sugar, eggs and vanilla and mix thoroughly. In a small bowl, whisk together your flour, baking powder, sea salt, cinnamon, cloves, all spice, ginger and nutmeg. Pour your dry ingredients into your wet ingredients and stir until just combined. Pipe (as detailed above) or spoon the batter into the donut tin. Fill each donut between 1/2 and 3/4 full. Melt 2 tablespoons of butter and use a pastry brush to gently brush the melted butter over the tops of the pumpkin donuts. Place the donut tin on the middle rack of your preheated oven and bake for 15 minutes. Whilst they bake, whip up your glazes. For the Chocolate Glaze: put the chocolate + milk in a small, microwave-safe bowl and microwave on high for 1 minute. Once out, stir until all of the lumps are gone, add the powdered sugar and stir until completely smooth. Add milk in small 1 teaspoon bits until you get the correct consistency. For the Spiced Glaze: Throw everything in a bowl and whisk until smooth. 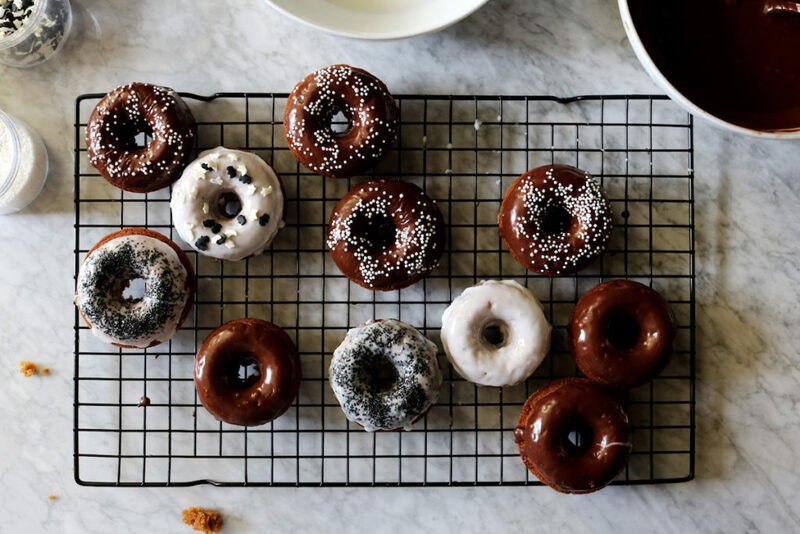 NOTE: you want the glazes to be thick enough to stay on top of the donut, but not so thick that your donut sticks to the glaze while you’re dipping it; so keep this in mind. Both glazes will firm up while they sit…add milk in 1 teaspoon increments until it’s smooth again. Let the pumpkin donuts cool in the pan for 10 minutes, then pop out of the pan and finish cooling on a rack. Sometimes there is some donut covering the hole in the middle of the donut (does that make sense? )…if this happens, turn the donut over in the pan. This will push the extra donut chunks off of the donut. 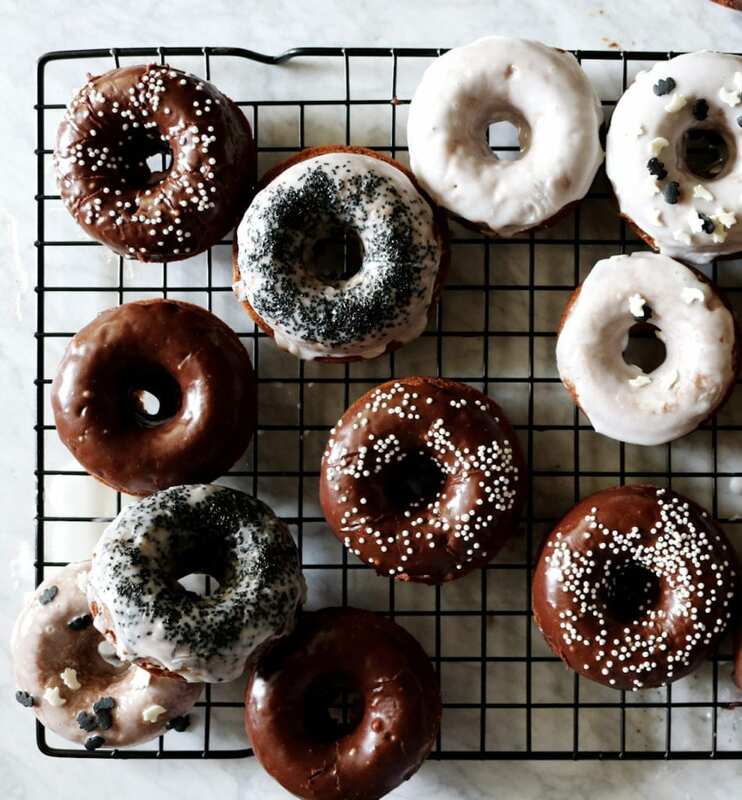 When you’re ready to frost, dip the bottom side of the donut (the prettiest side) into the glaze and twist and slowly pull out of the glaze at an angle. Continue to spin the donut, upside down and at an angle, trying to keep most of the glaze on the donut and letting the excess drip back into the bowl. 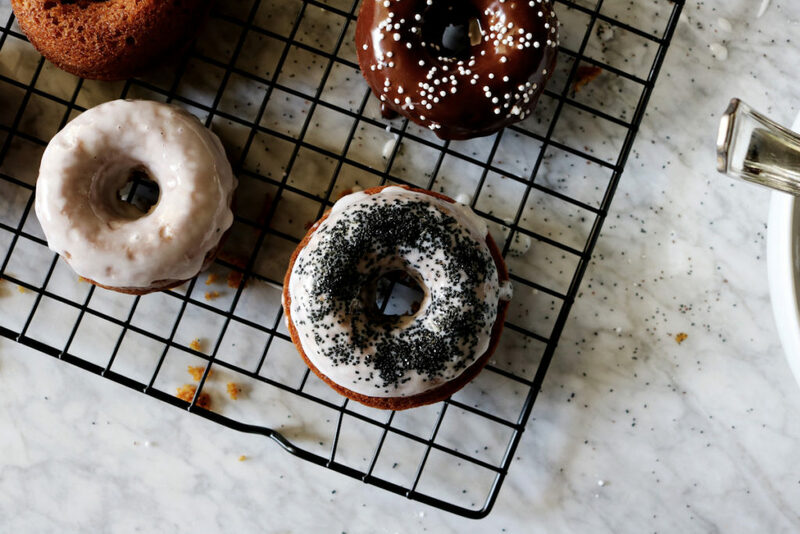 Set the pumpkin donuts back on the rack to firm up and sprinkle with anything your heart desires. 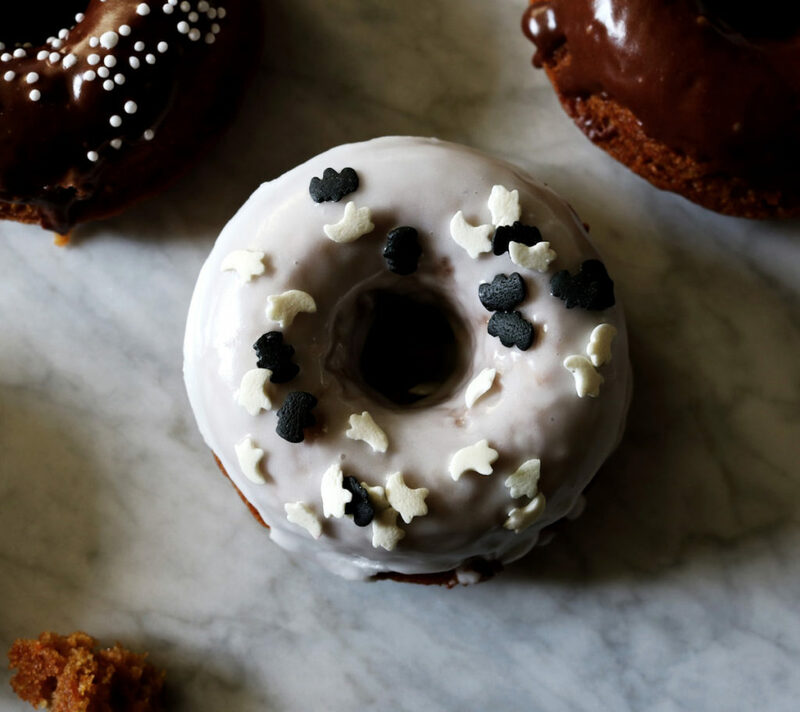 I hope you love these brown butter pumpkin donuts!!! Store airtight at room temperature…they’ll keep for a couple of days. Be sure to tag me @displacedhousewife #displacedhousewife so I can see your pumpkin donuts!! 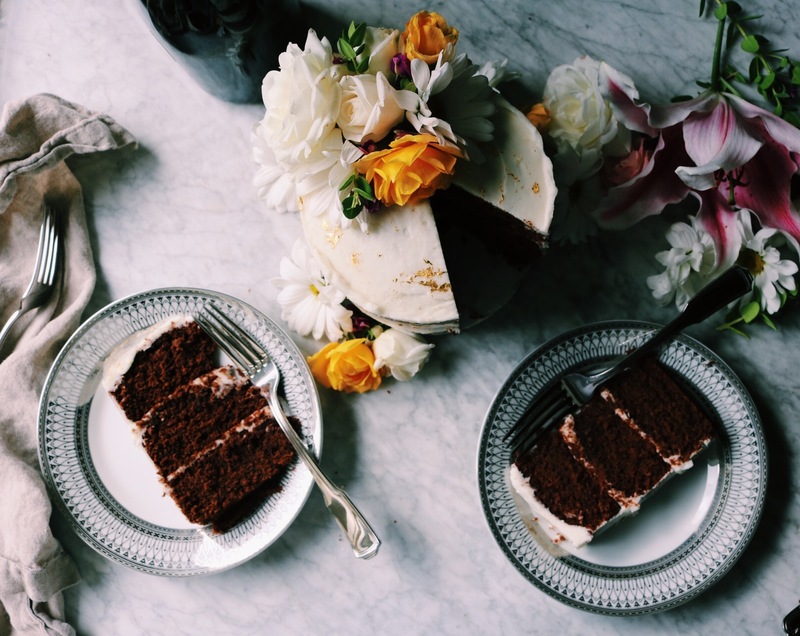 The following recipes were created by a ton of talented food bloggers!! If you want to peruse these recipes on Instagram, you can use the hashtag: #virutalpumpkinparty. This is an interesting read…be sure to watch the videos too. Stella and I made my Apple Spice Cake for @thefeedfeed’s Instagram Stories. You can watch it here. This one’s a quickie. More Fall Recipes: Apple Cinnamon Muffins, Slow Cooker Spiced Apple Cider, Spiced Apple Cake, Spiced Pumpkin Chocolate Chunk Cookies, Petite Pumpkin Scones, Pecan + Tart Cherry Granola, Giant Chocolate Chip Cookies (one of my favorites! ), Fresh Fig + Pecan Fall Salad, Thai Thai Scones and Breakfast Crack Cookies, Maple Oat Scones, Harissa Steak Chili, Pumpkin Gnocchi and Dark Chocolate + Espresso Babka. Sending lots of love + peace. I’m of the same mind set with regards to the doughnut pan.. as I am a yeasted doughnut girl. So I’ve resisted. I’m not sure I can stuff another pan into my kitchen anyway, but you make me want to jump in the car and hunt down a pan, Rebecca! They are just perfection and I LOVE how much pumpkin you stuffed into them! Delicious work my dear! These donuts look incredible!! I’m sure I could eat at least 3 in 1 sitting :) Happy belated Pumpkin Day!! I still have not converted to baked donuts, I’ve never even eaten one! But they turn out so cute (and convincing) and especially with the brown butter I think it’s impossible for them not to be awesome right? nothing better than donuts, baked included. and pumpkin and all those warm spices…yes, yes yes! i know what i’m doing this weekend! Baked donuts!? That is brilliant! I have never tried making donuts! can you believe that?! These look absolutely scrumptious and I will have to try making them! BTW I LOVE your pics here! So halloweeny and cute! :) Beautifully photographed! Thank you so much for inviting me to this party! :) You are simply the best! Much love! I’ve never made baked donuts but you are totally inspiring me, Rebecca! They look so delicious and I love the different ways you’ve decorated them – especially the ghost and bat sprinkles. Think I need to make these for my pals at the office for Halloween ! That’s quite a pumpkin party!! LOVE the donuts. I can’t wait to get back to my kitchen in a few weeks and do some serious cooking again :) And thanks for the Girls on the Bus rec. We know a gal who is covering Trump for NBC, and she says the campaign events are getting scarier by the day… the utter breakdown of civil discourse is so disheartening. Donuts seem like a perfect balm. I’ve been hiding in stacks of books – particularly cookbooks – counting down the days til this miserable election is over. You know I am obsessed with my donut pan. My kids go crazy when I make them and now they ask for them all the time. It’s a problem! These look so good and I love the browned butter addition. Thanks for sharing all those yummy pumpkin recipes! 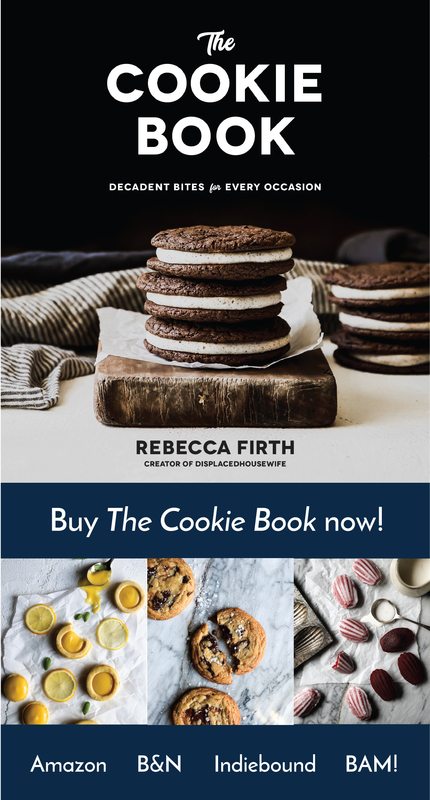 Oh Rebecca, do these look delicious!! I love making homemade donuts. And I know the browned butter in these makes them even better. That spiced glaze sounds perfect. Can’t wait to go through that impressive list of pumpkin recipes! Thanks for sharing and hope your week is off to a great start! I loved seeing you and Stella yesterday on the FeedFeed IG stories making the apple cake! Yay Stella! 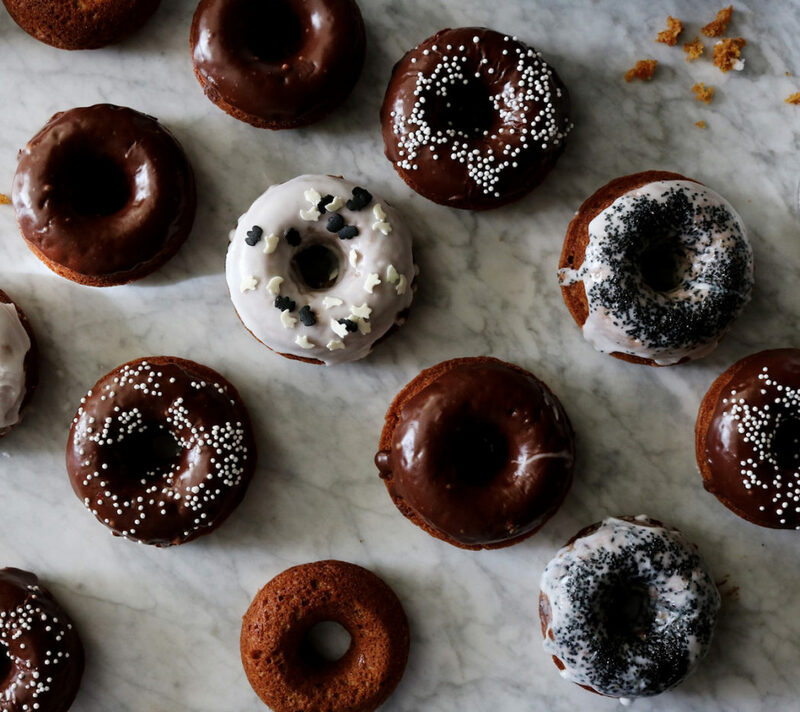 I’ve always been dubious of baked doughnuts but you make them look so good, I’ll have to give them a try!